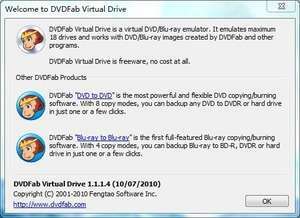 DVDFab Virtual Drive is a free disk drive emulator which can emulate both DVD and Blu-ray drives. It comes in handy at times when you're annoyed by adding and removing physical disks to your system when you could just mount an ISO image with the click of a mouse pointer. The tool remains active in the tool bar allowing you to mount up to 18 different DVD/Blu-ray images at once. You can unmount and re-mount the images from the menu after clicking the icon in the system tray. Version 1.5.1.1 is a freeware program which does not have restrictions and it's free so it doesn't cost anything. For security reasons, you should also check out the DVDFab Virtual Drive download at LO4D.com which includes virus and malware tests. Additional screenshots of this application download may be available, too.